Stephanie and Brian are Fun In the Sun Weddings newest Newlyweds! For this bride and groom, their adventure from Match.com to Mariachi has ended in happily-ever-after. Match.com can celebrate another victory! Stephanie and Brian are an online dating success story after meeting on the popular platform. Brian proposed to Stephanie during a Wisconsin winter festival, and they celebrated under fireworks on top of a mountain. Then following that chilly winter engagement, they decided they wanted a beach wedding, and the beautiful backdrop of the Caribbean was the perfect fit! 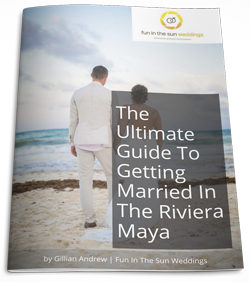 Playa Bella Weddings & Travel held their hands through planning a destination wedding at Dreams Riviera Cancun. Lori took care of all of their guests’ travel needs, while Erin handled their onsite wedding details, going over and above to make their vision even better than they imagined. She even sourced out adorable personalized maracas as wedding favors that all of the guests loved. At the ceremony, Brian turned his back to the scene and when the time was right, he turned around to see Stephanie come down the aisle. With huge smiles their eyes met. It was one of their favorite moments from the day. Another favorite was dancing to the mariachi on the rooftop at their sunset cocktail hour. Also, there was dancing down the beach at their wedding reception surrounded by their loved ones toting sparklers. All in all, it was dream wedding day! Brian and Stephanie, we wish you all the happiness in the world in this next adventure as husband and wife. Come back and see us soon! Congratulations! 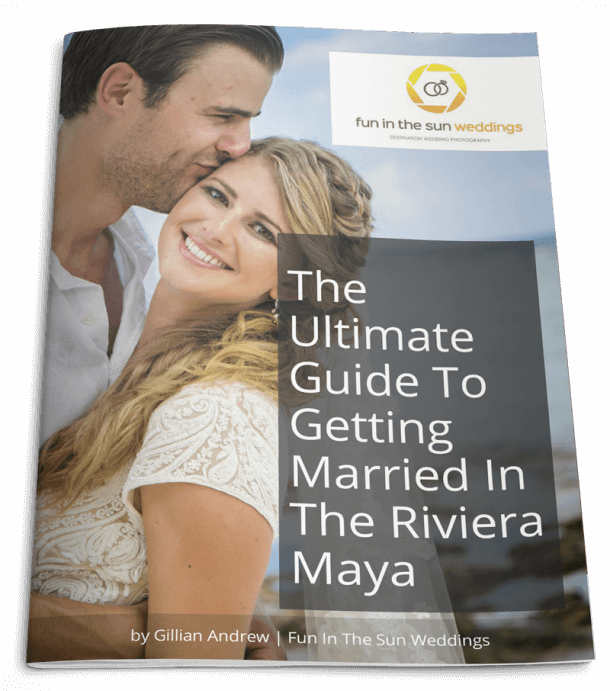 So, are YOU getting married in Riviera Maya and want the best Cancun wedding photographer for your beach wedding? Then contact us now! We are Fun In The Sun Weddings, for the best Riviera Maya wedding photography. A HUGE thanks to all of you for capturing our special day!! It was an incredible day that even surpassed our big expectations and we can’t thank you guys enough for helping to capture the special moments.